Red Cross volunteers respond to the Great Pandemic, 1918. Re-posting from our friends at The Blue Review to highlight the seriousness of flu seasons. 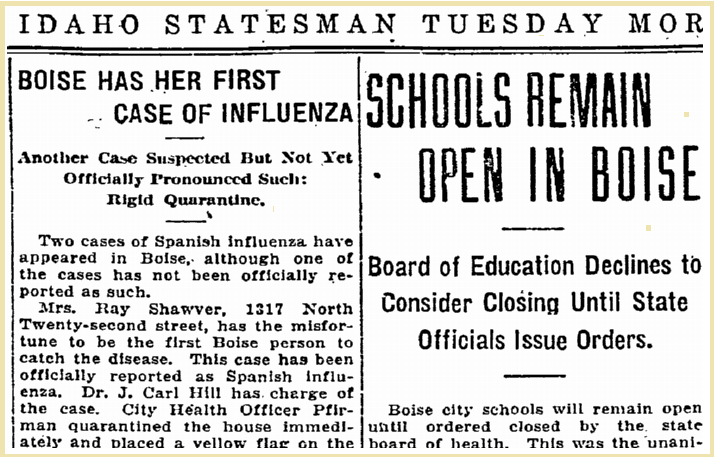 Our North End connection is Olive Shawver who lived on N. 22nd and was the pandemic’s first Boise fatality. As the virus continues to become more virulent, with each increasingly rapid mutation, we all need to be aware of what the disease can do. Keep in mind that, unlike 1918, Idaho is no longer isolated. The 2017/2018 flu season started much earlier and faster than previously predicted and is still holding on. Immunization and prevention are key to keeping safe. For more on the 2017/2018 Flu Season click here.